"We need to give ourselves permission to act out our dreams and visions, not look for more sensations, more phenomena, but live our strongest dreams — even if it takes a lifetime." One Woman's Quest for Peace"
Vijali Hamilton takes us on an extraordinary pilgrimage to communities across the world in her journey through “The World Wheel.” She opens to us and shares her world as an artist-sculptor-actress who travels from one country to another seeking new friends who learn about each other by word of mouth. What is your major dis-ease or problem? Then, working together with that community, they explore each question. 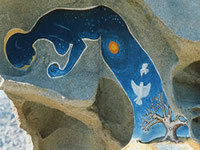 Various visual art and dramatic art forms are created to express each intrinsic heartfelt solution. One feels the understanding and love that develops between Vijali and the group during this process. The idea of a “World Wheel” developed out of a seminal sculpture, a stone circle, made on top of a mountain in California, a medicine wheel devoted to bringing together into harmony the divergent parts of our human psyche. Her voyage is a journey of making peace, through healing, and creating through participating in an adventure of truthfully examining ones root problems and dreaming, through art, a way of solving, of transforming and healing those problems. This takes a commitment of time, of real thought, and of energy to act. Some of the diverse expressions of these solutions are a tribute to the richness of the imaginations of the people involved, and of Vijali’s prodigious talents. Vijali felt she needed to extend her living prayer for peace to others. She marked off a certain latitude on a world atlas and followed it east, starting in California, moving to the Seneca Nation in the New York state, then on to Italy, Greece, Israel, India, Japan, China, Tibet and Siberia. In each country she made a new family of friends, a world family, filling a void in her own life. And now Vijali has started on a second World Wheel through the southern hemisphere, starting in the Andes of Ecuador. Please share her adventures as we hear from her!